I don’t know about you, but I love Halloween. There’s nothing better than cozying up in warm pajamas, watching the classics like Hocus Pocus and Beetlejuice. The sweet scents of pumpkin spice and cinnamon fill the air. If you’re a DIY girl like me, then you are already scouring the internet for fun Halloween themed projects. 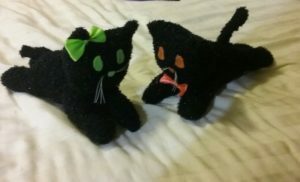 Today, I’m going to teach you how you can make these adorable, fleece plushie witch’s cats right at home. This project is super cheap, super easy, and takes roughly two hours. STEP 1: Take one of your fleece socks, lay it flat with the heel facing upwards, and trace the outline of the cat’s body with the silver sharpie. STEP 2: Use your scissors to cut along the silver outline of the body, but don’t cut down the sides of the sock. You want that fold to stay intact on both sides. TIP: Cutting this fabric can be quite messy, so I highly recommend doing this over a towel or pillow case for easier clean up afterwards. STEP 3: Sew along the edges of the back of the body and the front arms. You will need to leave the chest open for stuffing. STEP 4: Using the hole left in the chest, turn your cat’s body inside out, so the seams are on the inside. STEP 5: Stuff your cat. Be sure to stuff the back legs, then sew the hole closed. STEP 6: Take the other sock, turn it inside out, and outline your cat’s head in silver sharpie on the toe of the sock. STEP 7: Cut along the outline of the sharpie, keeping the original fold of the sock intact. STEP 8: Sew along the edges of your cat’s ears and top of the head. 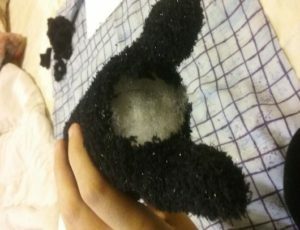 STEP 9: Cut a small hole at the bottom of the head (the top of the toe of the sock). STEP 10: Use this hole to turn the head inside out so the seams are on the inside. STEP 11: Using the hole at the bottom, stuff your cat’s head. STEP 12: Sew the head closed. STEP 13: Sew the head to the body. Make sure it is well secured. STEP 14: Using the left-over part of the sock you made the head from, and outline a tail. Cut it out and sew along the edges, but leave the end open. Using a pencil or your finger, turn the tail inside out so your seams face the inside. Sew the tail to your cat. STEP 15: To make the whiskers, take your white thread and cut 2 even pieces at 8 inches long. Thread both of these through a needle, and tie a knot at the end. Tie another knot in the middle of the thread. Mark out where you are going to put the nose and thread through it, pulling the middle knot to the fabric. Now cut both ends of your thread, you should have four whiskers on each side. STEP 16: Using your colored felt squares, cut out the eyes and nose (and mouth if you choose). Personalize your cat with whatever style of eyes and nose you want. Make it your own. You can add bows, ribbons, or make a tiny witch’s hat from excess felt. Whatever feels right to you. (I was going for a spookier kawaii look with mine). TIP: I used fabric glue to stick the eyes and nose to my cat. If you intend for this to be a toy for a small child, I highly recommend sewing the eyes and nose to the head to avoid choking hazards. That’s it. You’re done! Now go watch some Halloween movies and eat candy corn with your new little cuddle buddy. If you want more cat blog posts then please read Pawsome Kitty blog.